Something so sweet happened at school this morning, I can't even stand it. A few weeks ago Elliot read a story about a ginkgo tree in his "Click" children's magazine. Ever since we have been searching on the way to school for a leaf, and having various leaf conversations and hunts. Elliot even substituted torn maple leaves in the shape of a ginkgo to bring to school. His teacher, Emma, told us about a tree in Regent's Park even, but Dan & the boys were unsuccessful in their search when they visited. 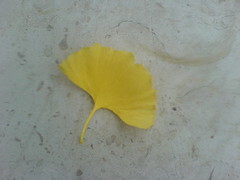 In France we finally discovered a ginkgo tree across from the hotel in front of the cathedral. Needless to say it was very exciting (see flickr pics) , and we had a small ginkgo celebration right there in Bayeux. Tuesday at school Emma was relieved to learn we had finally completed our mission. This brings us to this morning. Upon entering the classroom with the boys, Emma presented Elliot with a homemade envelope, decorated just that morning by Thomas (one of Elliot's school mates), full of gorgeous yellow ginkgo leaves. She had found a whole street of them on her way to work, pulled the car over, gathered some, and made a present for Elliot (with the other children's help) once she arrived. Oh, there is so much love at that school. Elliot's face was worth a million words, and he went over to thank Thomas for his beautiful artwork on the envelope. Emma gave me the address to her morning discovery, so I'm sure we'll be making a trip soon. Who knew there could be so much excitement and love over a tree? As I said before, this is the stuff of life. I'm soaking it up.